Log cabins are not built like a shed, at least the good ones aren’t. Sheds: When a shed is installed the floor is placed down first, the walls go on top of it and the build is continued. Log Cabins: With the majority of log cabins, the cabin is first built and the floor goes in afterwards and sits within the cabin and is not an integral part of it. The floor system is known as a ‘floating floor’ and should not actually touch the cabin walls although the floor joists may be and more often than not are attached to the log cabin foundation beams. All our cabins are built around the perimeter of a base and it is prefered that it is built on a foundation beam. As standard we supply 70mm x 44mm tanalised beams. These are supplied to go around the perimeter of the building and to sit between the first log and the base. Using these gives your first layer of logs protection from sitting directly in any water. If you would like something a little better we also have, as an option, profiled foundation beams. Tanlised foundation beams. These are supplied with all our cabins and go in between the base and the first log around the perimeter of the cabin. Understanding the above you will realise that all of the weight is on the perimeter of the cabin. When constructing a base consideration should be given to this. Sadly I’ve been to several fits where the centre of the base is great but the edges are all chipped and drooping where the shuttering has been removed as all the concentration had been placed on the majority of the base with an eye to shed building. The greatest strength for a log cabin base should be within the perimeter as this is where all the weight is. Our Log Cabins are extremely precise things, the best machinery is used to mill the timber and as such there is little tolerance. They are designed for each log to sit directly on top of one another and are interlocked in the corners via corner connection and the tongue and groove connection along the log. They are designed to withstand vertical forces, they are not however designed to withstand any lateral forces. 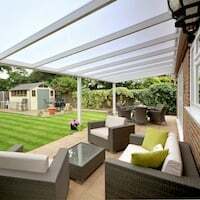 It is quite often tempting for a landscaping / building company, as they are used to doing with patios, to add a slight incline to the base to help with drainage. They tend to do this as a matter of course without consultation and are really chuffed to tell you that you have a 2 degree incline! This is really not very helpful as in effect you’ll be building your cabin on a slope and subjecting it to the lateral forces simply from gravity. A cabin is really not up to handling gravity and the subsequent sideways force it puts upon it when on any sort of slope. The end result will be a buckling and warping building and most certainly it will feature split and strained logs over time and of course the inevitable tears as you see your lovely building disintegrate over time. The logs won’t seat properly. The windows or doors will be on the huh. The apex will not sit flush with the upper wall leaving a gap which you will then have to trim to look anything, either with a planer or bits of wood stuck on it. The roof boards will not go on straight and there will be an incline in them which looks terrible and you will always notice it. Long term problems with warping, twisting, straining, cracking and splitting. You’ll be on the phone to me immediately during installation as it’s not going together or in about 3 months time when it’s falling apart. I’ll pop out and look at your base and tut a lot, we’ll end up arguing and you won’t even offer me a cup of tea! What if the base isn’t level? Sometimes we have to use what we’re given or that which is already laid and there’s not often a great deal we can do about it. Trying to add a screed to a concrete base to get it level rarely works and will simply fall away as pressure is put on it. If the base is out we have to do something about it before the cabin can be built, either it’s demolished and started again or another solution needs to be found. When I fit, which isn’t often these days I carry a box of ‘slithers’ of pressure treated timber in my van of various lengths and depths. Using these I could often overcome any deviation by adding them to the foundation beam and ‘chocking’ where necessary. However, if you are going to chock a cabin up for goodness sake make sure it is supporting the whole length and not just a corner. This was a log cabin ‘gone bad’ I recently visited to help sort the poor thing out. Its a bit of a long story but the customer had some particularly shoddy builders in to build it for them who neither cared nor had a clue what they were doing and this was a substantial and very expensive log cabin. The above image shows their version of chocking up the corner to make up the deficit in the unlevel base. This piece of plywood doubled up was supporting the corner of a huge 70mm log cabin. Not only had all the logs sagged across a 1m stretch the corner joints were also badly damaged and did not fit as it was still badly out of level. The apex was also ripped apart and don’t even get me started on the purlins. But if it had worked – the plywood would have rot within a year and the whole thing would drop and destroy the cabin anyway! I took the building down for the customer and reassembled it correctly and this is how I chocked the fault in the base, notice I am using tanalised timber and that it is being supported along it’s length and kept properly level. So, with a trusty box of slithers of tanalised timber most unlevel areas can be overcome just make sure you have several depths available to you. Please though, use timber that isn’t going to rot in five minutes and make sure the foundation beam is supported throughout its length and, importantly, make sure the building is completely level in both planes regardless what you do. 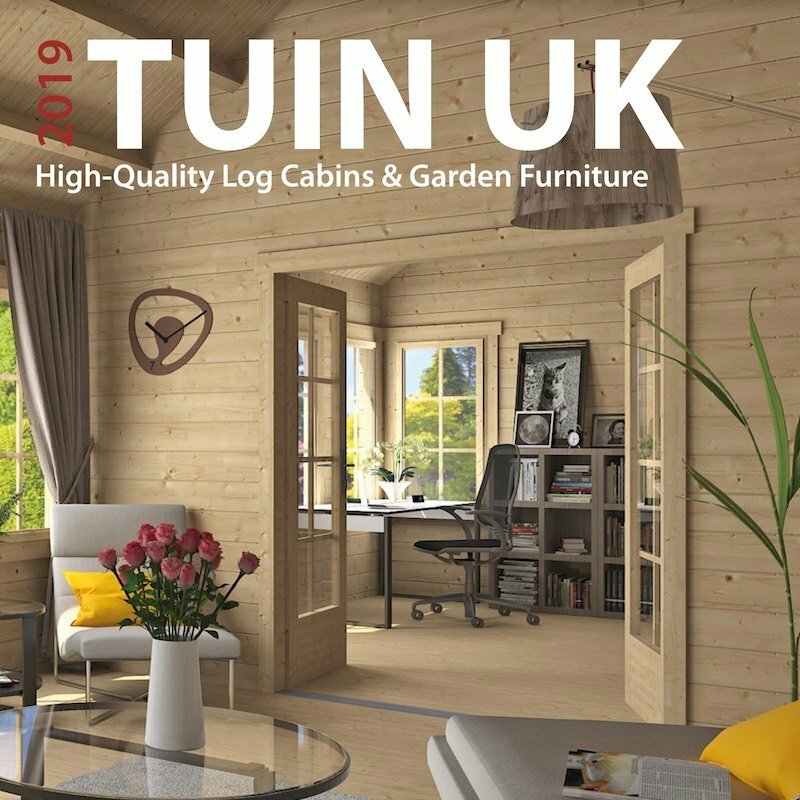 All Tuindeco log cabin measurement are taken from one end of the log to the other, so a 3.0m wide log cabin is exactly that, from the outer edge of the log to the outer edge is exactly 3.0m. The base doesn’t specifically need to be to this measurement as all the logs have a crossover connection, this is generally 100mm or less depending on the size of the cabin (please ask us for your particular building). In this example we could make our base at exactly 2.80m wide and the log cabin will fit on it exactly. Be careful though, there maybe a wiggle in the shuttering or somebody is not as exact as they could be, there’s no room for error when doing it exactly to the footprint so it might be wise to add a centimeter or two either side just in case. If it can be done though I think it looks far nicer, it also has the advantage that when it rains water does not hit the base and fly up and make your lower wall of your smart, new log cabin all dirty and mucky. Consideration should be given to the majority of the weight being placed on the perimeter of the cabin. Consideration should be given to the weight of the cabin, a 19mm is obviously considerably different to a 70mm. It should be 100% level in every direction. Ideally it should be square. Ideally to just over the footprint size of the cabin. I hope with the above waffle I’ve given you a little idea what we’re ideally looking for in a base for your new and sparkly log cabin. I’m not going to go into how to build a base as I’m not a builder or landscaper, nor would I want to be as it looks like jolly hard work. I will however give you a few examples of what can be done and used. A base of concrete can be done in a number of ways. 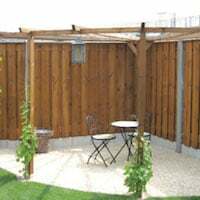 Generally it can be done with simple timber shuttering. The average base will be about 80 – 100mm deep. We can also get a little more complicated with a block work supporting wall and then filling with concrete, perhaps reserved for the bigger buildings that needs a little more weight supporting structure around the perimeter. If you’ve got a large building your landscaper or builder may advise steel reinforcing within the base itself, remember though not to forget the perimeter. For advice on mix ratios, strength of concrete etc I’m afraid I’m not the one to ask, there’s lots of advice across the net and it’s probably best you sought that information elsewhere. However! If i’m pressed to offer my very basic advice from experience use a mix of one bucket of portland cement to five buckets of ‘all in 20mm’ ballast gravel and add the water slowly, don’t make it too wet though, it needs to be a workable fluid, keep mixing until it’s uniform in colour. As a rule of thumb calculate the volume you require (LxDxB) and add one third. Creating the base is pretty straight forward, use timber board as shuttering to guide the edges, mark out the area and use a tape or string corner to corner to ensure it is straight. Level the shuttering with a spirit level and pour your concrete. Keep working it across the surface with a board until it is level with the top of the shuttering boards. Allow it to set for three or four days and et voila your base is formed. Alternatively; ask someone who know’s what they’re doing. The above concrete method sounds good in principle but I’ve never managed to get it right and still had a few undulations in it, depressions are fine, hills aren’t so good! This probably doesn’t even need an explanation as it’s very cost effective and pretty simple to lay. Again like concrete follow the base criteria I mentioned. Normally a 70mm layer of dry sand and cement is sufficient, tamped down until level with the slabs then levelled on top of it. A quick method and probably the cheapest and can work for most of the cabins we sell. This I can get right and is pretty straightforward, just make sure it’s all level. I have in the past tried the various other ‘eco’ slab bases but I could never really get on with them, they were more expensive than a simple concrete slab and still required the same amount of levelling, I still remain to be convinced of their real benefit and hope to be one day. This is by far my favourite method of laying a base, of course it’s not the best way I just enjoy doing it as there are so many permutations and challenges. 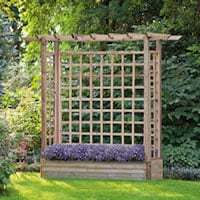 It’s using a timber frame supported by stilts, or pads or simply paving slabs positioned at intervals. I find it a good environmentally friendly solution and great for areas where concrete is just not possible or when there are steep inclines to overcome. The perfect way of building a timber frame base. The first foundation logs have been added. Square and level is the key! Give consideration that the majority of the weight is being placed on the perimeter of the cabin. Give consideration to the weight of the cabin, a 50mm base is not going to cut it for a a huge 70mm beast of a building. 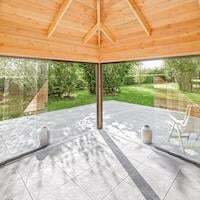 Just one last thing for you to consider and a bit of advice, if you’re opting for a concrete or paving slab base think about adding a damp proof membrane either within it or on top of it, this will then stop any damp coming up and impacting on your log cabin during the winter months. I hope this has helped, feel free to comment or contact me if i can help further especially with the timber frame bases as I really enjoy these and love seeing them used in tricky situations. For advice on the slabs and concrete bases it might be better to ask a builder! Advice on using a Damp proof course in your base. The base configuration when using our profiled foundation beams. Insulation in the floor and foundation beams. 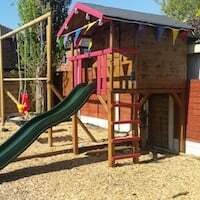 This entry was posted in Log Cabin Fitting Tips, Technical - Log Cabins and Timber and tagged base, construction, fitting, log cabin, log cabins by Richard. Bookmark the permalink. I’m no landscaper so other people may have better advice but normally you would place the slabs on a bed of sand. A mixture of sand and cement will give very stable support. I am planning to buy a Karen log cabin when I move into my new bungalow. All this advice and finding Tuin has made the project exciting! One topic I have not seen covered is the way a high base which projects above ground can take your cabin over the 2.5m at ridge. Already I am concerned that 50mm insulation on top of the roof will make it too high! Comments welcome. I am 66 and have a bad back, so I considered a ground screw / timber beam solution – nice and light, but with 150mm beams, much too high. I shall probably go for a plastic grid base and found Probase, which supports 16 bull elephants and requires no gravel infill! Ground will need reducing and levelling but they say it needs no scalpings below. Being empty plastic, it needs no DPM on top, only beneath for weed control and will breathe better than concrete or slabs. My 50mm Celuform floor will sit straight on without floor joists. And the cost is low, £250- £350 for a 5m x 3.2m Karen. Any comments welcome, as I have not made a decision, but my concerns are low weight, low height, and ventilation. Even with the probase I would still recommend you install a DPM to be sure as dampy can still come up through the cells of the base tiles. You can also insulate within the roof rather than on top if the height is a consideration although this is a little trickier and ventilation needs to be allowed for within the roof. Thank you for your very informative site, it has really helped me in making the right decisions. I, like you, are a timber man, and really enjoy the design and creation of these, also, i dont know why, but I just feel that wood is the way to go. I have drawn up my plans using your posts and probably done far too much research online 🙂 and I am confident on the construction and stability, so thanks for all your time putting these together. The only question i really have is, If this is a Timber frame, do i still need to use the foundation beam or not? Is the foundation beam used for under the door or does the door framing include this? i thought i read somewhere in your posts that if it was a timber frame the foundation beam was optional but i cannot seem to find it again. If you are using a timber frame base you do not really need to use the foundation beams as you are already lifting the building away from ground contact. You could though use the composite profiled beams which give it a nice finish and also a natural lip around the base. Foundation beams go around the entire building including any door way. As with any base system the strength, integrity and longevity is going to come from what is under it. As you mentioned; the most back breaking part will be the preparation according to the ground conditions and the structure you are installing. Remember though all we are interested in with a log cabin is that you support the perimeter of the building so it is 100% level and free from subsidence over it’s life time. How the floating floor part of the build is supported would depend on your requirements and imposed load. For larger buildings it is often more economical to provide a strip foundation around the base and then pier foundations supporting the floor joists. Of course toy will always provide a damp proof membrane within or on top of the base you use. Regarding the plastic base interlocking grid system; I have used these but mainly with greenhouses as the drainage they offer is perfect for a greenhouse. For sheds, summerhouses and log cabins or indeed any other building I’m still not convinced and personally do not really like them. My top reasons being the cost, a paving slab is around £2.50 – £2.80. The plastic ones are around £5 – £6.00? That can potentially add quite a bit to a base. I’m also concerned how a seal is formed between a log cabin foundation beam and also the effectiveness of a damp proof membrane considering you would have to use it either under or on top of stone shingle that could present a risk of puncturing the membrane maybe. With that said I can see a huge benefit in the weight reduction in using them and transporting them to site and also maybe laying them. But, the groundwork still has to be done so large quantities of aggregate still needs to be taken to site so if you’re taking that why not take the paving slabs as well. Or you could also use a timber frame base if the distance, bulk, weight and cost is excessive. I can see certain times a plastic interlocking grid would work but personally I still favour the three main methods for economy and ease with a log cabin. Thanks for this. Different people I’ve spoken to say the same. If your going to do it then use a concrete foundation. I will just have to take my time and get the base done properly and place the order for the cabin to arrive at the right time. Great advice on all the blogs on your site. Thanks. Will check out Martins ground screws suggestion as well. Thank you for these details, this is not something I have ever used. I will have to investigate these myself. I want to lay a concrete base to the exact size of my log cabin garage. What considerations need to be made for the expansion/contraction of the building? Is it simply a case of measuring the footprint or is there anything else to consider? Ideally the base will be made to the exact footprint of the log cabin. There is no need to account for expansion of the logs lengthwise as this barely happens, expansion and contraction only takes place across the width of the log. Great informative page. 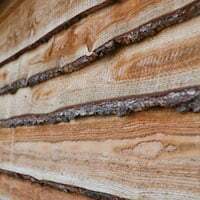 I am from a construction background but its still good to see detail like this for a specific project such as a log cabin and the pros, cons, do’s & don’ts. Now to order the materials :-). I’ve used the information on this site to design and build my log cabin sub-frame, out of 4×2, and its an excellent base, much better than concrete. So thanks very much for the information here, its been invaluable. I’m in contact with others who are doing a similar job but have a concrete base and its causing all sorts of issues as water can get in and has nowhere to go. We are expecting our Hendrick cabin any day now. I’m bulding a raised timber base, and I am about to install the floor joists. One thing thats puzzling me is that I often see photos of the joist hanger height straps folded over the top of the perimeter frame … this plus the height of the nail heads is surely going to mess up the nice flat surface. How do people get the first log to sit properly on top of this? Thank you for all the advice on this site, it’s been really helpful. Joist hanger straps are only generally only 1 – 2mm thick and can easily be knocked down flush with the timber frame base. It should not be a problem getting the bottom log sitting nice and flat. I have seen the ground screws online but as yet I don’t know of any customers that have used them, I have no experience of them. I’d be interested in seeing them in action though and views from anyone that has used them. I do wonder what benefits have they over a timber stilt supporting a timber frame though as the cost is going to be quite a bit higher I think? 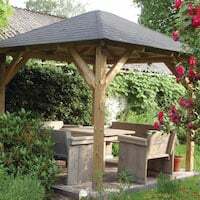 Richard, I have ordered an Aiste cabin from Tuin and as my garden has restricted access and an terraced I opted for 12 ground screws to support a laminated timber framework base. I was wondering if 47mm by 100mm timber would be adequate as the price difference for 47×150 is not an inconsiderate bump up in price. Any size timber can be used but this of course depends on the support you give it, if you are using smaller timber then more support is needed, you can also consider laminating it for strength. Consideration should be given to the imposed load – the things you are putting in the cabin, sometimes this can weigh more than the cabin itself, especially in the case of a home gym. Where the perimeter isn’t level you can cut strips of bitumen coated roofing felt to support the walls. It won’t rot or crack and the profile changes when weight is applied just enough to fill the void. Not a bad idea, we tend to do this under floor joists that are bouncy in places. 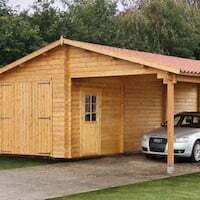 Hi Richard, I have a 2.0×2.9m Tuin log cabin coming next week which will sit on a concrete slab. The old slab was extended to accommodate the footprint of the new log cabin. Unfortunately, the extended slab on two edges isn’t level – there are some low bits and some high bits with the variation being within the range of about +-10mm. I’ve read your blog and know that I need to get some tanalised timber ‘slithers’ to shim the foundations. Do you know where I can source these in the UK? I’ve been looking at marine ply sheet as an option but am not sure if it is sufficiently rot resistant. Finally, is it possible to plane away material from the foundation beams without compromising the pressure treatment? Thanks. Hi Richard, have you come across the Krinner ground screw system and their use with wooden cabins? They look like a great alternative to wooden post on a timber frame base, on the face of it cheaper and quicker than a concrete equivalent. They offer a company install or self install with a two week option rental of their equipment. I haven’t come across those before, they look similar to the spirafix system which I have used in the past with some success. If you use them i’d love to know how you get on. Hi Richard, great advice on this site. So we’re going to buy one from you this week! I have already built a timber frame for a deck at 400mm centres using 6×2 all supported by 4″ sq timbers in concrete every other joist and riser support every joist. Overall size 6×5 mtrs. The idea was to put the 5×3 summer house on it, then deck round it. The summer house beams would be across the joists so a nice even spread of the weight. So my question is this. Being 400mm centres the joists are not going to be exactly under the perimeter but will be close. Is this going to be an issue? Thanks again for a great site. The logs will need to be supported along their length around the perimeter dimensions. It maybe better to deck the entire platform and then build the cabin onto it. Yes, I think that makes more sense. Also solves an issue about the floor as I want to insulate so would need to add a false lower floor otherwise to support the insulation. How high is the door above the base level? In other words how much height do I have for the floor? When we supply a floor the joists are 44mm thick, you have enough room to then add either 18mm or 27mm or anywhere in between on top. Thanks. Last question… honest! How much gap should I leave around the floating floor for expansion/contraction. 5mm? Thanks again. At this time of year – Spring / Summer I would be looking at a 5mm – 10mm gap. During the Autumn / Winter months this would be slightly less due to the moisture content in the timber caused by relative humidity. 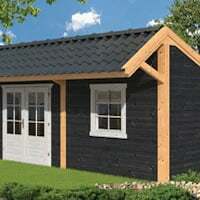 Ive ordered a small log cabin from a local supplier today. 3×3.3m. I assumed it would be built on a frame of tantalised bearers. I was told that the underneath of the whole floor is tantalised…not the rest of the cabin..and as it will be sitting on my timber decking with no bearers I wondered if this isn’t a good idea? I have asked for the damproof membrane to be laid on top of the decking and this is being done but I’m still worried about possible damp and rot. 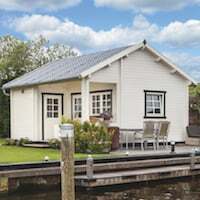 I’m female, no clue about anything to do with construction but have been reading up and looking at cabins for a while and I know that bearers on a concrete base is usually the norm. The cabin must go on the deck there is nowhere else for it to go but can you tell me if I should be insisting on bearers? Most cabins are untreated and depending on your supplier are made from Spruce or Pine. Spruce is the better material if you can get this. Ideally we like to protect the first log of the cabin from ground contact and we can do this with a foundation beam, a damp proof course, a timber frame or even a brick course. If you are placing a cabin on decking then generally you are taking the first log away from ground contact. I would though always recommend a damp proof membrane between it and the floor. I would also like to see some protection against the fist log. If you have it directly onto decking you could also consider a fillet of silicone against the decking and the first log to stop anything getting underneath, alternatively a damp proof course under the fist log will also help. Another good idea is to treat underneath the first log and its sides. A good quality treatment is always recommended, with enough layers for a good level of protection. 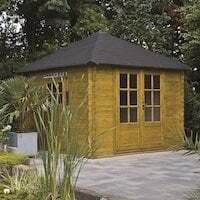 I have a concrete base of 22 ft by 13ft which previously had 2 small sheds on it when i moved it, after pulling down the 2 small sheds i would like a 20 x 12 / 6 x 4 summer house on the base place. the problem is there is about a 6 inch incline on the 13ft depth part rising from the bottom to the top. the width of 20ft is level. can i lay a timber base on top of the concrete? or would chocking be an option. any help much appreciated. Hi – this is a really useful article. What are your views on the plastic rapid fit type foundation grids? 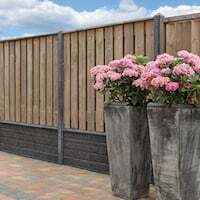 These were offered to me by the log cabin retailer as a very quick and cheap alternative to a concrete base and also claim to offer very good drainage, Do you endorse their use? i have seen and used the rapid pads / eco base / plastic tiles before but I’m still not convinced. You still need to carry out the same preparation when using them as in levelling and laying sand as you would when using paving slabs. Plain paving slabs are cheap whereas the plastic ones are quite a bit more expensive. The only benefit I can see from the plastic slabs is that they are light and easy to work with. They are though great for use in a greenhouse as they provide drainage. in Holland we here a lot about screw fundations. It’s rather expensive though But if there is a leveled pavement and a wooden fundation is that good enough? The best base for a log cabin is 100% level, square and free from subsidence over the lifetime of the building. a timber frame or paving slabs, concrete etc can accomplish this very well. Trying ro read everything to educate myself in preparation for building a cabin on our property. We are tearing down a 117 yr old homestead. The new cabin will require a foundation. Your article has made the most sense to my dense brain and I am beginning to see the light. Thank you for writing it and being so concise and clear. I am saving this. Fantastic advice and insights here – thank you! I’ve just had a concrete base poured and will be building a 44 or 70mm wall cabin on this in the summer. The base measures 2.7 x 5.2m, and I plan on building a 2.5 x 5.0 cabin. The base is generally dead level in the short direction, but the long direction has a slight ‘hump’ at about 3m. I estimate the level from the hump falls away by ~10mm by the time it reaches the ends. I know that the base needs to be level, but just how level? Will the cabin foundation need shimming to account for this, or would there be enough flex in the cabin to conform without causing structural issues? The base should be as level as it possibly can be, having a hump will cause you a problem, please do not rely on the logs to flex and accommodate this. The options you have is either to shim the foundation beam (if you are using them) or alternatively cut away the foundation to account for it. Since my last post I have gone ahead and had a reinforced concrete base made for the shed. As this was on a sloping garden the base has to be slightly in the ground at one end and higher at the other, which has also meant building a retaining wall! More than half of the cost of the shed again and I think I got off lightly. Fantastic, thanks for your reply. I’ll work along the lines you suggest. I am currently planning a 20ft x 14ft 44mm log cabin in my garden. The garden is quite bumpy and slopes in both directions. I was planning on levelling the area and having a concrete base, but the soil is clay so this will have to be quite deep I think to prevent the concrete from cracking. Any ideas to minimise the expense would be very gratefully received. What is not clear to me, and I have not seen discussed is the means of bolting down the composite base beam to the foundation, be it concrete, or raised timber frame on posts. This would seem important in the very high winds during winter months. It is a good idea to fix the foundation to the base in cases of buildings in exposed areas. This is also applicable with garages or open cabins to give additional support either side of the entrance. Fixing of the foundation beam can be accomplished with a number of methods as required including rawl plugs and screws, L brackets or compression bolts. For larger buildings and to save money it is a good idea to concentrate only on the footprint of the walls of the log cabin. This is the most important thing to worry about and which effects the main building. The floor could be supported with piers at intervals so you don’t have to have a huge slab of concrete. The comprehensive advice you give is extremely helpful, thanks. My query is: – I am planning to have a Rune which is 5m x5m. In your above advice, you say that when making the concrete base, concentrate on the outer perimeter, as this is where most of the weight of the building is supported. You say that the concrete base doesn’t have to be a big block, you can make a surrounding base with the floors supported by piers. Could you explain this in more detail please? a log cabin and the floor need to be treated as two seperate things. For the cabin it must be supported at the footprint of the building and the support need to be 100% level, square and free from subsidence. Therefore for larger cabins, for budget sake, you could consider making a ‘footing’ which carries out this job. The could be a strip of concrete, brick course etc. For the floor you could consider using paving slabs, cast concrete at intervals to support the floor joists. This would be similar in principle to the timber framed bases. Making strip footings and then using piers to support joists can make the base considerably cheaper. I’m not clear whether concrete base should be square-shaped even for a rectangular building or not! Also, should I use the points where the wall boards intersect to determine the size of the base or the full length and width of cabin? Anyway, brilliant blog and thank you for the valuable content. The base needs to be the minimum of the footprint of the building. This post helps to explain the ‘footprint‘ This does not take into account of the corner cross overs which are not critical to support, it also looks better in my opinion. Brilliant advice thank you for taking the time and your honest and heartfelt advice. My concrete base does not have e dpm. I am erecting a 3 x3 cabin in February. Shall I just lay a dpm on top of concrete same size as cabin and build on top? I’m worried it may get damaged during build in floor area by stepladders. What do you advise? If you cannot put a DPM within the base then as you have said putting it on top is best. Of course as you have said this will get damaged while you are installing, it is also very slippery and dangerous. Personally I will use a roll of DPC around the perimeter of the cabin between the base and foundation. Then build the cabin and finish the roof. Then lay out a DPM inside the building and dish it against the foundation beams. Then lay the floor. Thank you. I have found the advice and instructions on this site incredibly helpful. It has given us the courage to attempt a self build of a pentagon cabin. I erected a Tuin 5m x 5m on a steep dirt slope in Greece. The whole thing sits on joists 200×50 forming a timber suspended floor at 40cm centres with noggins at 600mm centres. Whilst half is supported on a cast concrete wall on a concrete base the other half is sat mainly on 2m tall 60cm x 60cm concrete columns.The columns contain reinforcing bar sunk well into the soft ground and are sat on 120cm x120cm x 45cm deep concrete pads.Large pads on soft ground are must. Intermittent timber supports sat on concrete pads front and sides were also necessary. Such a good article. I’m building a log cabin in Spain, on quite steep mountain-ey terrain. Was wonderin whether a timber base could be used on stilts of different lengths, then a cabin just built on top. From what I understand, this is possible! Now to check out the rest of this site. Good article. Helpful comments with a large dollop of common sense! Well written common sense. Cheers.